Justice of U.S. Supreme Court, 1790-99. Attorney General of N.C. during Revolution. Home stands 200 ft. east. 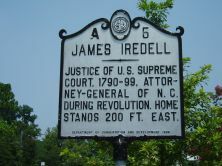 Few men have had more influence on the modern American judicial system than lawyer, judge, and writer James Iredell (1751-1799). Originally a representative of the Crown, he challenged the colonial court system and was instrumental in the creation of its American successor. Iredell was born on October 5, 1751, to a merchant family in England, the oldest of five children. With the family business on the verge of bankruptcy, in 1768 Iredell immigrated to Edenton. Once there, family connections provided secure employment as customs comptroller for King George III. He simultaneously apprenticed under lawyer and future governor Samuel Johnston, entering private practice in 1771. As he practiced law and remained customs comptroller, his personal convictions clashed with professional interests. Finding fault with colonial courts, Iredell expressed dissent through a number of insightful essays. Among his finest works were his criticisms of British rule in America. As the thirteen colonies drew together in opposing England, Iredell realized that British laws were not always feasible on American soil, and with this conclusion, joined the revolutionaries. 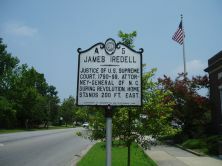 After the Revolutionary War, Iredell found himself at the center of judicial reform. In 1777, he was appointed to the superior court, where he helped to create North Carolina’s judicial system. His task complete, Iredell resigned himself to private practice in 1778, a hiatus from public service that would prove to be brief. He returned in 1779 as North Carolina’s second attorney general serving until 1782, when he resigned to private practice once more. 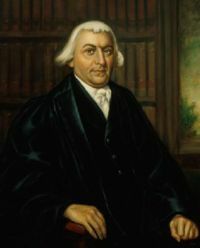 In that capacity Iredell helped establish the doctrine of judicial review when he represented the plaintiff in the landmark Bayard vs Singleton case of 1787. Iredell was among the most influential federalists, advocates of strong federal government. In 1787, he traveled to Philadelphia to further the federalist cause, although meeting with defeat. Two years later federalists realized their goal as North Carolina ratified the federal constitution in 1789, one of the last states to do so. Rewarding his efforts, the following year George Washington appointed Iredell as one of the first federal Supreme Court judges, where he traveled the federal circuits, interpreting the Constitution. The stress of constant travel took its toll; after a decade of service, Iredell could stand no more. He died on October 29, 1799, and is buried in Edenton. In recognition of tireless devotion to state and country, Iredell County (est. 1788) was named in his honor.